Honored for Leadership in "Plan Design & Administration Innovation"
Strategic Benefit Services (SBS) is pleased to announce that Carol A.Idone, CFP®, AIF®, Vice President, Client Relationship Management and Consulting, is the recipient of the 2017 SPARK Advisor Award: Plan Design & Administration Innovation. an increase in the PBGC premiums. Contributing entities making two reinsurance fee payments for 2016 must remit the second contribution payment. Plan fiduciaries should have an established framework on which they can defend their investment decisions should they ever be challenged. The process should begin with the construction of the plan’s Investment Policy Statement (IPS). Although not required by the Employee Retirement Income Security Act (ERISA), drafting an IPS is a fiduciary best practice. The IPS serves as a policy guide that can offer an objective course of action to be followed when emotional or instinctive responses might otherwise motivate less prudent action. Which investment style has dominated over the long haul, active or passive? Active vs. passive performance trends have been cyclical, with each experiencing its own periods of dominance. It is widely believed that the Morningstar Large-blend category (stocks in the top 70% of the capitalization of the US equity market where neither growth nor value characteristics predominate) is the most efficient category, or one that would customarily favor passive investing. However, even this category shows the cyclical nature of active and passive performance. Currently, we are experiencing a period of time when the performance of passive large blend funds is trouncing those actively managed. Stable value investments have been a core investment option in defined contribution retirement plans since the 1970s and are an attractive alternative to money market investments due to steady returns and principal preservation guarantees. Stable value funds have proven their worth to investors during the protracted period of low interest rates present since the recent financial crisis. Consider the following comparison of 2007-2016 calendar year total return for the Vanguard Federal Money Market Fund (VMFXX)[i] to the SBS MetLife Stable Value Fund. "Avoiding Litigation and Fiduciary Pitfalls"
Fiduciaries of defined contribution retirement plans are under closer scrutiny than ever before. Plan participants are filing lawsuits, and a number of organizations, have recently appeared in the headlines as defendants in class action lawsuits relative to their retirement plans. Lawyers on behalf of retirement plan participants are now setting their sights on non-profit institutions. This is a wake-up call to all non-profit organizations to make sure their retirement plan fiduciary oversight is robust and compliant. 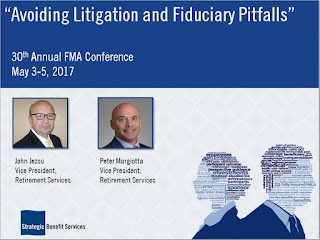 Join us on May 3rd at the 30th Annual FMA Conference where Retirement Advisory experts John Jezsu and Peter Margiotta will present "Avoiding Litigation and Fiduciary Pitfalls." The presentation includes an overview of ERISA and DOL requirements for plan fiduciaries, retirement plan litigation, the risk to the healthcare and not-for-profit industries, preventative measures to avoid litigation, and what the future may hold. Did you know that your PBGC* per-head cost will have increased 130% between 2012 and 2019? And your PBGC variable rate will have increased by 390%! Required minimum distributions (RMD) for first time qualifying participants, including 5% owners. Deadline for corrective distributions for 402(g) excess contributions. Form M-1 must be filed by multiple employer welfare arrangements (MEWAs) and entities claiming an exception from MEWA status (automatic 60-day extension is available upon request). Corrective distributions for failed actual contribution percentage (ACP)/actual deferral percentage (ADP) test without 10% excise tax penalty (for plans without EACA). Corporate tax returns due and contribution deadline for deductibility (without extension). Due date for automatic extension to September 15 for corporate tax returns. Electronic filing of Form 1099-R for distributions made in 2016. Strategic Benefit Services wants to help you stay compliant with our 2017 Retirement and Employee Benefits Compliance Calendar. Compliance is just one of many services SBS provides. Visit our Retirement Plan Services and Employee Benefits service pages to learn more. If you have any questions regarding compliance requirements or their application to your plan, contact us at (855) 882-9177 or at sbs@hanys.org. PLANADVISER Magazine has named Strategic Benefit Services (SBS) as one of its 2017 Top 100 Retirement Plan Advisers. We have been awarded in the categories for large teams with $4 billion or more in retirement plan assets under advisement, and large teams with 180 retirement plans or more under advisement. The PLANADVISER Top 100 Advisers is an annual list of the retirement plan advisers and adviser teams that stand out in terms of a series of increasingly stringent quantitative measures. The Internal Revenue Service (IRS) issued Revenue Procedure 2013-22 in March 2013, which provided guidelines for issuing opinion and advisory letters for §403(b) prototype plans and volume submitter plans. The Revenue Procedure stated that a remedial amendment period would be available whereby eligible employers could retroactively correct defects in the form of written 403(b) plans. Understanding your retirement plan’s fees is not only a good practice; it’s a fiduciary requirement as prescribed by the U.S. Department of Labor (DOL) under the Employee Retirement Income Security Act (ERISA). The traditional enforcement mechanism has been DOL plan audits. More recently, high-profile litigation has driven plan sponsors to evaluate their plan fees. These fees can be grouped into several categories: record keeping, administrative, legal, plan advisory, investment, and education and communication. The principal reason fees have been thrust into the limelight is that plan participants often bear most, if not all of the cost of running the plan. Transistional Reinsurance Fees due for insurers and plan sponsors of self-insured health plans.. Determination letter submission deadline for individually designed plan documents. This applies to plan sponsors with EINs ending in 1 or 6. Form 1099-R to participants who received a distribution in 2016. Download our Employee Benefits Survey Report and the Employee Benefit Survey Webinar Presentation Recording to understand what these results mean to you as an employer, and what challenges and risks you may face when attempting to offer a competitive benefits package under the Affordable Care Act. If you have any questions, or would like to begin talking to an employee benefits advisor about wellness programs, please get in touch by email or by calling (855) 882-9177.